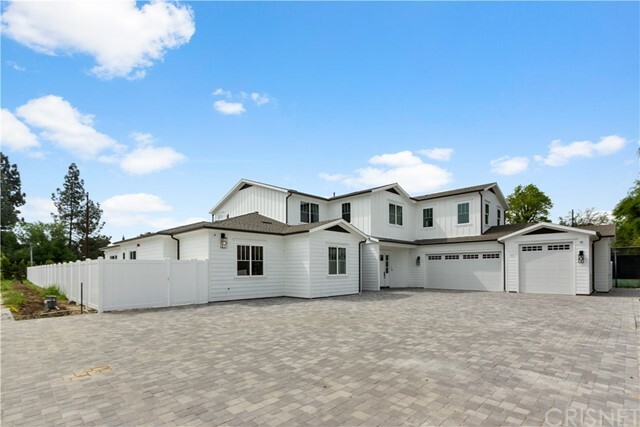 Stunning new construction home in the prime Walnut Acres neighborhood of Woodland Hills. This seamless reinterpretation Modern CapeCod is a one of a kind custom design with an exceptional combination of unique design & quality finishes. The front door opens to reveal soaring ceilings w/ custom raised insets & a classic open flow. Located within the highly coveted El Camino School, floor to ceiling windows & glass doors in the main living areas draw in abundant natural light & flow out to the private luscious yard and rectilinear pool & spa, fire pit and custom built-in BBQ center.